AEI presents at the SAME Anchorage Post monthly lunch meeting - Ahtna Environmental, Inc. AEI presents at the SAME Anchorage Post monthly lunch meeting - Ahtna Environmental, Inc.
Ahtna Environmental, Inc. was well represented at the Society for Military Engineers (SAME) Anchorage Post February 25, 2016 monthly meeting, held at the BP Energy Center. Project Manager Matt Flynn, and Environmental Scientists, Vivian Tokar and Sara Perman led the charge in presenting our experience and expertise in performing complex environmental projects in remote Alaska locations. Our long time teaming partner, Geosyntec Consultants, represented by Ben Martich, also contributed to the discussion. The idea of presenting at the monthly luncheon was inspired by an article we published in SAME’s Jan-Feb 2015 edition of The Military Engineer, on the topic of remote logistics. AEI Vice President, Tim Gould, PE, who was president of the Anchorage Post until the end of 2015, signed up our team to do the lunchtime presentation, which provides participating professionals the chance to obtain professional development credits. To prepare, the AEI team contacted the US Army Corps of Engineers (USACE) Alaska District to discuss their views on the impact of current technology on remote project delivery. USACE representatives noted that, as a general rule of thumb, costing a remotely located project in Alaska requires adding $1-2 million to the budget to account for the price of logistics. With this information in mind, AEI discussed two project examples where we tried to reduce logistics costs. The first project discussed was the ongoing site investigation on Atka Island in the Aleutian Islands, where we incorporated the use of an iPad with an off-the-shelf software application that allowed us to complete an extensive site investigation within a single field season in an area that often experiences inclement weather. The second project was a removal action and thermal remediation project at FAA Station Strawberry Point, where we researched the feasibility of applying a Geosyntec-developed technology, STARx, to help reduce the fuel needs of the onsite thermal treatment unit which is run by a 10,000-gallon fuel tank (the technology was ultimately not feasible for the site). 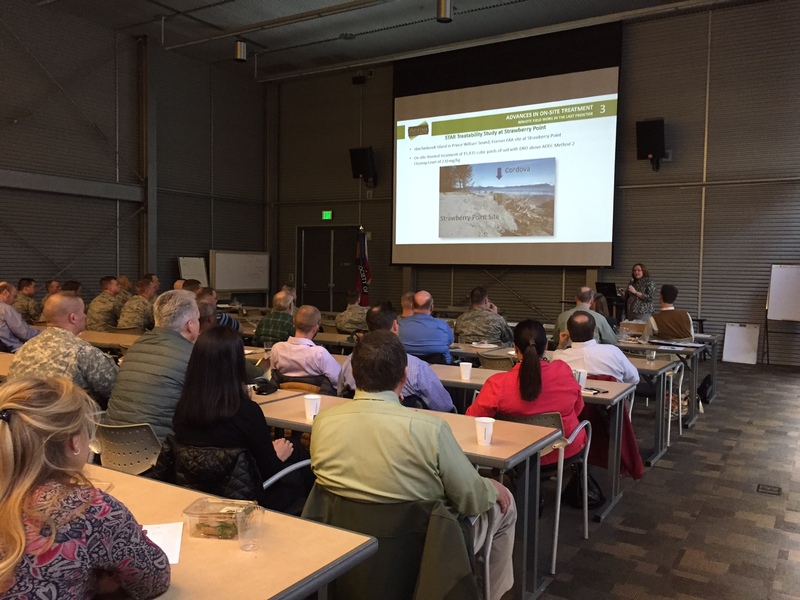 The team presented to a group of about 30 to 40 attendees representing contractor firms as well as the government, including representatives from Joint Base Elmendorf-Richardson, and USACE Alaska District. The full presentation is provided in the link found below.